Our eyes will possibly get some relief from the blinding flash of cameras in low-light scenarios. 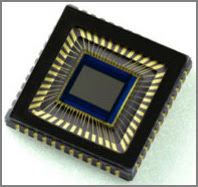 South Korea's Electronic Technology Institute announced the development of a new image sensor chip that allows digital cameras to capture vibrant images without a flash in dark spaces. I guess I'll need a darker filter for my long exposures! Great, now I don't have to keep defending flash photography over those low-light shots...you know, the ones that are not White-balanced, are overly yellow, or are clearly under-exposed! So what? Since when does the relevence of a photograph depend on technology? oh, wait, I might even use my brain instead. Welcome to the Second Era of papparazzi. I was thinking that when this chip becomes a reality, as in being installed in camera bodies, it wouldn't be necessary to replace your existing cameras, just add a body for low light photography. I'm up for it. It will allow them to ship cameras with 11-stops darker superzoom lenses.